BRIDGEPORT — The Madonna baseball team swept a doubleheader against Bridgeport (OH), 14-0 and 5-3, on Saturday for its second and third victories of the season. In the first game, the Blue Dons led 7-0 going into the seventh inning before doubling their run total. Dom Brncic was dominant on the mound, picking up the victory in six innings of work. He allowed no runs on two hits, no walks and struck out nine. Jake McKay pitched the final inning and also allowed no runs on no hits, three walks and struck out none. Offensively, Dom Mazur led with three singles and three runs batted in. Dylan Austin collected a single and two RBIs. Matt Amaismeier and Luke Beatty each tallied two singles and an RBI. In the second contest, Madonna led 5-0 going into the bottom the sixth, before Bridgeport scored twice in that inning and once in the seventh. Mazur started and picked up the win in four innings of work. He allowed no runs on two hits, four walks and struck out a pair. Amaismeier pitched the final three innings, allowing three runs on three hits, no free passes and struck out three. Just like the first game, all of Madonna’s hits were singles. Christian Ridway had a pair. Brncic recorded two RBIs, while Amaismeier and Austin had one apiece. MADONNA: Brncic (WP, 6IP, 0R, 2H, 0BB, 9K), McKay (1IP, 0R, 0H, 3BB, 0K) and Beatty. BRIDGEPORT: Gregorcic (LP, 4 2/3IP, 5R (2ER), 7H, 2BB, 6K), Jozwiak (1IP, 2R, 2H, 2BB, 0K), Flannigan (1/3IP, 3R, 1H, 3BB, 0K), Dulesky (1IP, 4R, 5H, 1BB, 0K) and White. TWO OR MORE HITS: Madonna (Amaismeier 2, Beatty 2, Mazur 3); Bridgeport none. DOUBLES: none. TRIPLES: none. HOME RUNS: none. RBIs: Madonna (Amaismeier, Beatty, Mazur 3, Brncic, Ridgway, McDaniels, Elias, Gray, Austin 2); Bridgeport none. MADONNA: Mazur (WP, 4IP, 0R, 2H, 4BB, 2K), Amaismeier (3IP, 3R, 3H, 0BB, 3K) and Brncic. BRIDGEPORT: Fouty (LP, 4 1/3IP, 5R, 7H, 4BB, 1K), White (2 2/3IP, 0R, 1H, 0BB, 1K) and Savvegot. TWO OR MORE HITS: Madonna (Ridgway 2); Bridgeport (Dulesky 2). DOUBLES: Madonna none; Bridgeport 1 (Jozwiak). TRIPLES: none. HOME RUNS: Madonna none; Bridgeport 1 (Fouty). RBIs: Madonna (Amaismeier, Brncic 2, Austin); Bridgeport (Fouty, McKivian). CADIZ — The Harrison Central baseball team held off a late comeback from Buckeye Local to win its season opener, 6-5, on Saturday. Andrew Clelland started for the Huskies. He pitched five innings, allowed four runs (all unearned) on four hits, one walk and struck out eight. Logan Tonkovich pitched the final two frames and picked up the victory. He allowed one run on three hits and no walks. Dalton Watt pitched the first inning-and-one-third for the Panthers, allowing four runs (three earned) on three hits, three walks and struck out one. Shayne Christian took the loss, pitching four-and-one-third innings in relief. He allowed two runs on two hits, three walks and struck out five. Alan Burkett recorded the final out. Offensively, Skylar Mazeroski tallied a single, double and run batted in. Clelland had a double and an RBI. Trevor Carman delivered two singles and an RBI. For Buckeye Local, Freddy Hertler had a single and a double. Owen Long, Matthew Scott and Daniel Kelly each contributed a single and an RBI. Both teams play one another again on Monday at Buckeye Local. BUCKEYE LOCAL (0-1): Watt (1 1/3IP, 4R (3ER), 3H, 3BB, 1K), Christian (LP, 4 1/3IP, 2R, 2H, 3BB, 5K), Burkett (1/3IP, 0R, 0H, 0BB, 0K). 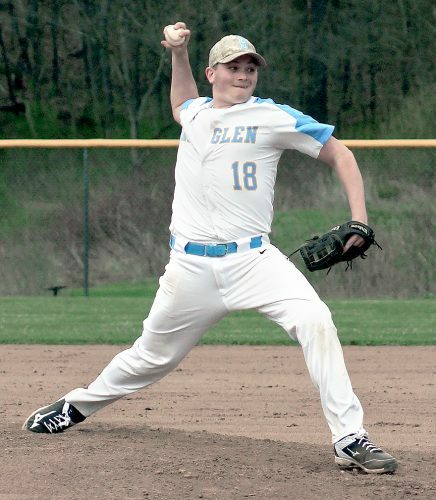 HARRISON CENTRAL (0-1): Clelland (5IP, 4R (0ER), 4H, 1BB, 8K), Tonkovich (WP, 2IP, 1R, 3H, 0BB, 0K). TWO OR MORE HITS: Buckeye Local (Hertler); Harrison Central (Carman 2, Mazeroski 2). DOUBLES: Buckeye Local 1 (Hertler); Harrison Central 2 (Clelland, Mazeroski). TRIPLES: none. HOME RUNS: none. RBIs: Buckeye Local (Long, Scott, Kelly); Harrison Central (Carman, Capers, Clelland, Tonkovich, Mazeroski). WELLSBURG — The Brooke baseball team fell to Berea-Midpark, 16-4, on Saturday. Jakob Bailey started for the Bruins and took the loss. He pitched four innings, allowed six runs (all unearned) on six hits, one walk and struck out four. Mason Thompson, Alex Jezierski and Dylan Silver combined to pitch the final three frames. Offensively, Thompson delivered two singles and an RBI. Camden Bates had a double and a single, while Nick Langley singled twice. Bailey recorded an RBI. BEREA-MIDPARK: Compton (2IP, 1R, 3H, 0BB, 1K), Cupach (WP, 2IP, 1R (0ER), 3H, 0BB, 2K), Backle (3IP, 2R, 4H, 2BB, 5K) and Swisher. BROOKE: Bailey (LP, 4IP, 6R (0ER), 6H, 1BB, 4K), Thompson (1IP, 0R, 0H, 1BB, 1K), Jezierski (1 1/3IP, 8R (7ER), 6H, 2BB, 1K), Silver (2/3IP, 2R, 3H, 1BB, 0K) and Pannett, Lippoli (4).